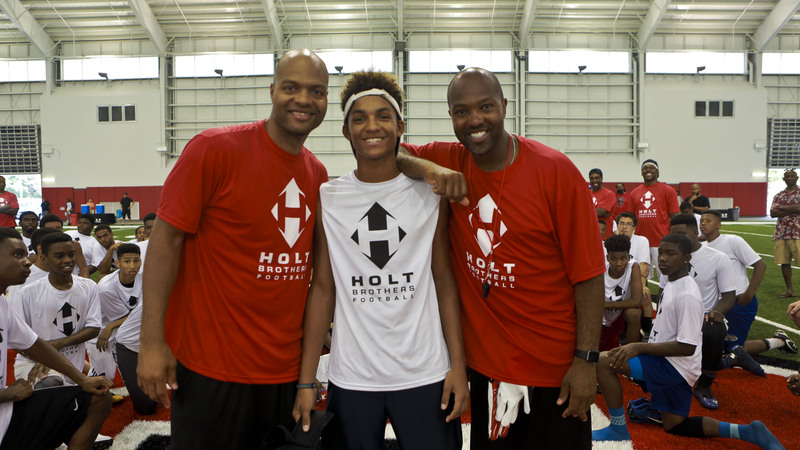 Football camp with the Holt brothers was a place where I learned that dreams do come true and to never let somebody tell you that you can’t do something. The Holt Brothers Football Camp is not a camp where you just learn about competing and working on your football skills. I learned a lot more about life at this camp than I did football fundamentals. It’s a place where you come in ready to work, show off a little, compete and win. The entire time you’re expected to show respect and sportsmanship. But like I mentioned — it’s not all about football. Torry, Terrence and the coaching staff emphasized all through camp that “football is a game of life” — in life and on the football field you have to be dedicated and work hard for what you want to achieve. I remember at the end of camp Terrence said, “Education comes before football. You can be the best athlete, but without an education you will not go anywhere to play at the next level.” Other cool aspects of the camp were touring the NC State Murphy Center and practicing in the new Close-King Indoor Practice Facility. When I sat down and thought about the camp (and not to brag about winning Session II MVP), but getting the MVP award wasn’t the best thing I left the camp with — it was the advice on how to be successful on and off the field that was the most valuable. I know myself and all of the other 2015 Holt Brothers Football Camp participants left the camp a better football player and a better person. I’ll definitely be back next year.